The Indiana Bill of Sale Forms are legal documents that are implemented between seller and buyer as a way to provide evidence of a sale that has occurred. These forms will also prove a change of ownership. Some of the forms will require notarization. If the form has to be notarized, do not provide signature until all signing parties are before a notary public. Vessel Bill of Sale – Used to provide proof of purchase and to prove a change of ownership of a vessel/boat. General Bill of Sale – This form is usually used between two private parties to prove the sale of personal property. Firearm Bill of Sale – This document is used to sell, purchase and transfer ownership between a firearms dealer and individual or private parties. 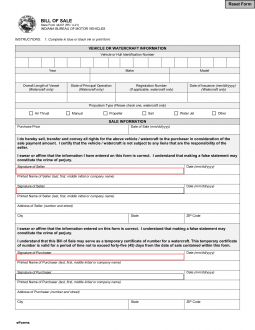 Vehicle Bill of Sale – Transfers ownership for an automobile. Go to the BMV prepared to pay all registration and processing fees. completed Application for Certificate of Title (Form 44049).